John F. Haight Jr., who led the Ridgefield police for more than 10 years, was probably the town’s first career policeman. Over a period of 30 years, Haight rose from constable to chief and saw the police force grow from three to 30 officers. “He was one of the moving forces to get us from the town hall basement to where we are now," said Richard Ligi, who joined the department under Haight and later became its chief. A native of Newburgh, N.Y., John Haight was born in 1920 and moved to Ridgefield as a child, attending classes in the old Titicus Schoolhouse, now the American Legion Hall. He graduated in 1938 from Ridgefield High School where he met his future wife, Marion Alice Roberts. The two were married in 1942; Mrs. Haight died in 1998. During World War II, he served in the U.S. Army's Fourth Armored Regiment under General Patton, landing in Europe shortly after D-Day and receiving the Bronze Star for heroism. One of his first jobs after the war was as an usher at the old Ridgefield Playhouse movie theater on Prospect Street. He also worked for the U.S. Post Office, driving bags of mail from the office on Main Street to meet the train in Branchville. In 1947, he was hired as a policeman — then officially called a constable — joining Charles Wade Walker and James Brady in policing the town under the command of the first selectman and operating out of 70-square-foot “quarters” in the town hall. Constables handled motor vehicle violations and misdemeanors while the State Police, quartered at the barracks on East Ridge, did the major cases. “In those days, we patrolled in our own cars,” the chief recalled. “We had no car, no radio, no equipment, no nothing.” The town bought its first patrol car around 1950. In 1955, Ridgefield created a formal police department, with James Brady as chief, and John Haight was among the first officers. 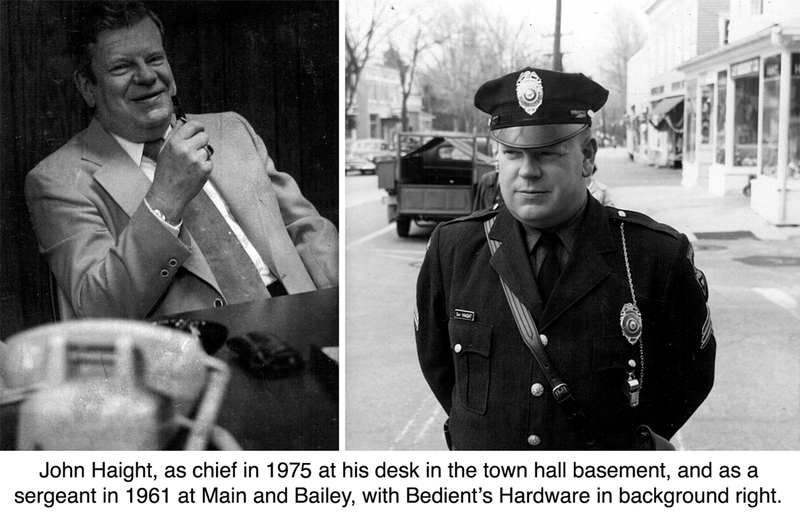 Ten years later, Chief Haight took command of the 10-person department, serving until his retirement in 1977 after 30 years on the job — a tenure few others have attained with the police force. During his nearly 12 years as chief, the department grew threefold to 30 officers, added a detective bureau, and moved from a few rooms in the town hall basement into its current quarters, the former State Police barracks, on East Ridge. “In all humility, I believe I have turned over a police department to my successor of which you, the community, will be proud,” he said at his testimonial in 1977. Some 250 people attended that farewell party. “It is amazing that a man with a name like Haight can represent so much love,” emcee Paul Baker said at the event. “He was always fair with his people and always concerned with their welfare,” said Chief Richard Ligi, who was hired as a teenaged clerk by Chief Haight in 1967. Chief Haight’s first home here was on Washington Avenue, but in the early 1970s he built a house at the north end of Lake Mamanasco. After his retirement, he moved to Cape Cod, but returned periodically for visits and to host testimonials — after he stepped down as chief, he became a celebrated toastmaster, enjoyed for his wry wit. One of the last formal affairs he attended was a retirement banquet for Thomas Rotunda, who had succeeded him as chief. He died in 2002 at the age of 82 and is buried in St. Mary’s Cemetery.